Cha Am Fishing Park is situated in the Southern part of Phetchaburi Province located 175km’s South West of Bangkok in Central Thailand.Cha Am Fishing Park in Thailand is located in the picturesque coastal resort of Cha Am a pleasant 2.5 hour drive from Bangkok and boasts two purpose built commercial fishing lakes holding various monster fish species.The fishery is an established freshwater complex of two lakes which has been stocked with various monster freshwater fish species . 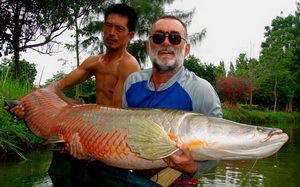 Offering the visiting angler the chance to fish for both Carp and Catfish species in addition to angling for Arapaima and other predators in relaxed and pleasant surroundings close to the stunning white sand beaches of the nearby Gulf of Thailand. 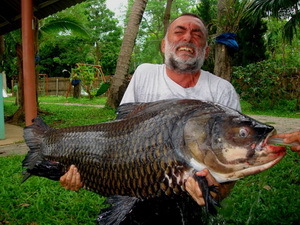 The Carp and Catfish pond is heavily stocked with various Thailand monster carp and catfish species such as Mekong Catfish to 60kg+,Striped Catfish, Giant Siamese Carp to an estimated 60kg’s ,Rohu and several smaller species such as Small Scaled Mud Carp and Java Barb. The Carp and Catfish pond covers an area of approximately 3 acres with variable depths ranging from two metres to fifteen metres at its deepest part. One bank of the Carp and Catfish pond is bordered by a sheltered concrete fishing platform which offers anglers shade from the sun or rain. Angling methods at this venue are similar to those used at other venues with fish being caught on both sliding float presentations fished mid depth and feeder setups fished hard on the bottom. When angling at this venue Carp and Catfish Lake anglers can expect to experience plenty of action by the hard fighting carp and catfish species’ which reside in its murky depths. The lake is popular with expats and local anglers alike and pretty much ensures anglers will catch plenty of fish on even the slowest day. 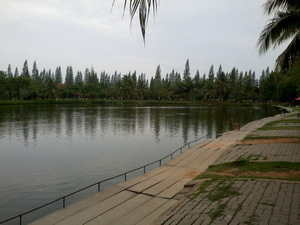 A typical days angling at this venue should produce Striped or Mekong Catfish on most casts when employing sliding float/ feeder tactics in the central body of water. Alternatively the carp at this venue are regularly hooked using delicate float fishing tactics with breadflake the going bait at the time of writing. Using a lift presentation with a delicate quill float accounts for a large proportion of the carp species caught from this venue when fished quietly in the nearside margins. When angling for carp at this venue it is essential to remain quiet and fish stealthily as the carp can be caught literally inches from the bank on some occasions. The Predator Lake is a smaller more intimate water which covers roughly 1.5 acres with variable depths , seasonal algal blooms and several quiet bays. The Predator pond has benefited from several stockings of the Amazonian Arapaima or Pirarucu and several other Amazon monster catfish species and now boasts several Arapaima estimated to be around the magical 100kg range. The Arapaima Pond has seen relatively low levels of fishing pressure in comparison with many other lakes in the region and the bigger fish are still caught quite frequently on either live or deadbaits. Productive fishing methods on the Predator Lake include both float fished fish sections cast to showing fish in addition to freelined deadbaits in the margins which regularly account for various monster sized Arapaima upto 1.6 metres in length. Other species present in this venue include Redtail Catfish, Sorubim, Barramundi and Snakeheads. This venue is a perfect fishing venue for both families and serious fishing enthusiasts which is situated in close proximity to the stunning beaches,bars and restaurants of Cha Am. This venue offers clean basic overnight accommodation in the form of well appointed air conditioned bungalows for anglers wishing to stay onsite in addition to an onsite restaurant serving delicious Thai cuisine. With an onsite swimming pool and easy access to the many restaurants, bars and food stalls in the nearby town this venue makes a perfect place to explore the local fish markets and temples. With the considerable travelling distance from Bangkok (2.5-3 hours) we advise anglers to visit Cha Am Fishing Park for two or more days, alternatively anglers may like to consider incorporating this venue into a multi venue package when stingray angling at the Maeklong River in Samut Songkran which is located only a short 50 minute journey from Cha Am. Trips to this venue can also be arranged for anglers staying locally in the immediate area or in the Hua Hin area.